Already know what you want? to fill out our brief form. We'll get back to you right away with a price quote. It seems very rare these days to come across a good product service provider but, I found one. Ron Collinson and Arlene Ferrigno are the answer to your prayers in designing and delivering a very high quality product. We recently worked with them to design new lapel pin sets for our unit. They are gorgeous! Better than we asked for at a great price! If you have a need for any of their products I truly believe you can buy with confidence from this company. I returned to work today and the box with the pins was at my office. They look great! Dealing with you was very easy and thanks for the quality looking pins. They are going to look fantastic on our uniforms. Just wanted you to know I received the ring you made for me and am extremely (!) happy with it. Thanks so much. The workmanship is wonderful and it has a great feel to it. Wishing you well. I want to congratulate you on such an awesome work with our Intel Unit coin. You under-promised and over-delivered. Everyone in our shop was impressed with the details and the quality of product. On behalf of our Unit: thank you very much. I just wanted to personally thank you again for all the work and dedication that you and your company put into our Commemorative badges. We received nothing but compliments from every single person who purchased one. I received the coins. Great job! Thank you (again) for your patience. Maybe after you retire you can go around the country providing failing businesses with Customer Service seminars? A+++++ and Five Stars! I want to thank you and the team at Collinson. Everyone is ecstatic at the coin. Outstanding craftsmanship and design. All coins have been spoken for. I just wanted to let you know I received the package with no further issues. I would also like to say thank you very much for your excellent customer service in helping me resolve this matter. More companies need people like you working for them. Collinson Enterprises was fantastic to work with. I hope any future endeavors that come along, you will think of their business to use or recommend. They bent over backwards to accommodate our needs on the anniversary badge. Taking on the initial expense and distribution. All we had to do was commission the badge, they handled everything else. I received the coins today and they are AWESOME!! The collectors in this office LOVED them. I would like to thank you and your staff for doing such an outstanding job on the coins. Again they are the BEST!! 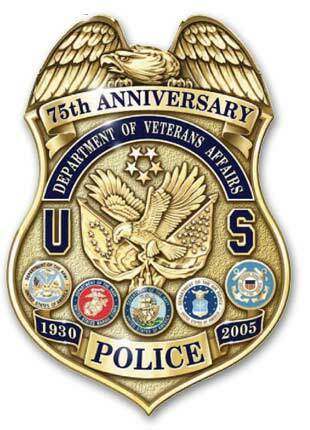 Thank you so much for taking a special interest in our order of 66 USPO 75th Anniversary Badge Sets. The badges are attractive, well-made and even more attractive in their presentation boxes. The four of us that are 'in the know' can hardly wait to present them to the rest of the staff at Thursday's recognition luncheon. It is refreshing to experience "sincere customer service." On behalf of all of us who have seen the sets, we want you to know that you have enabled us to present what we feel will be keepsakes. The coins look fantastic! Everyone is very impressed and, predictably, more wish they'd ordered. Thanks again for making a great coin! Got them when I got home last night and they are great. I had checked with other companies, also had ordered from other companies and yours excel in quality, price and time it takes for production. Thank you for high standards. I wanted to let you know that we�ve received the badge pins that you designed/created for us and they look great! Thank you very much for your tremendous work on this! I look forward to doing business with you in the future. DEAR SIRS, I HAVE JUST RECEIVED MY FOP MEMORIAL BADGE. IT IS EVEN BETTER LOOKING THAN THE PICTURE ON YOUR WEB SITE. I AM THE VICE PRESIDENT OF MY LODGE AND WHEN I SHOW IT AT OUR NEXT MEETING I AM SURE YOU WILL RECEIVE MORE ORDERS. YOU ALL DID A GREAT JOB. I�m impressed with your efficiency. Pleasure doing business with you. That was quick. I RECEIVED PACKAGE LAST NIGHT AND IT WAS THE BADGE. IT IS AWESOME AND ALL OF THE FOLKS IN THE UPS CENTER GOT A CHANCE TO SEE IT. I GOT HOME LATE LAST NIGHT AND UPS HAD LEFT A NOTICE, SO I CALLED AND THEY TOLD ME I COULD COME BY EVEN THOUGH THEY WERE CLOSED TO PICK IT UP. THANKS SO MUCH. YOU DID AN AWESOME JOB AND I HOPE THERE ARE LOTS OF ORDERS. Our badges for Discovery Cove turned out perfect. Thanks so much, look forward to continuing to do business with you. Excellent, well done, being in law enforcement I recognize a quality product when I see one and yours are outstanding!!!!!! 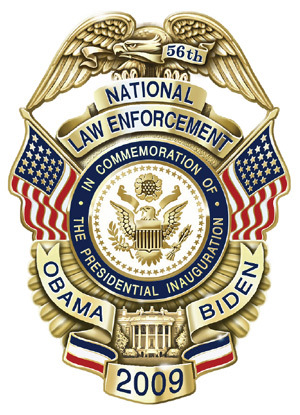 You do great work and let me say once again how much we appreciate your outstanding work on the Inaugural badges! I look forward to continuing our work together. The pins arrived this morning and I just had to take the time to tell you that they are gorgeous. Thank you for doing such an outstanding job. The pin shipment came in this morning and they look GREAT!!! They are among the best pins I have ever seen! Thank you for making sure the lapel pins were exactly what I wanted. Your service is the best, which is rare now days. I would highly recommend your company to anyone wanting service and the right pin at the right pice and delivered when promised. Thank you again for making sure we got what we wanted. The art work is tastefully done and makes the coin a real "keepsake". I'm glad the history of our campaigns was included on the obverse. I am delighted to display it on my desk. I received my order last Saturday, and wish to tell you that I am very pleased with the products and appreciate your excellent service. We have the pins! They are AWESOME!!! Everyone at Grassfire loves them and we can't wait to get them out to our on-line team members. I received my badge today and it is better than expected. Believe me, I will treasure it and keep it in a safe location. You done good, boss. Thanks again for everything! The retirement ceremony was a success and the Retirement Badge was the frosting on the cake. I received the pins today. They look great. Thanks for the good work. Hopefully in the future we can work with you on some custom badges. I am a volunteer in Bedford County, VA and the ones you did for them were awesome. Thank you very much for the quality and detail you provided in the pins for our department. Today we honored the fallen officers of our department and gave each officer in attendance one of your pins. They were well received and each officer left with it displayed on their uniform. Thanks again. Just wanted to let you know that I received my G-Man ring a couple of days ago and was very impressed with its appearance, quality, and workmanship. It is a very beautiful and unique item that I will proudly wear, enjoy, and treasure for the rest of my career and into retirement. 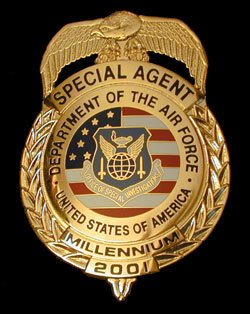 Many thanks for making available a specific ring for our agency. This is unbelievable. I love it. The SAC [Strategic Air Command] has approved. I'm a badge collector so i look all over the net for badges of all kinds. . . but yours is the best. Damn, you do good work !!! You really put out a quality product. The badges you did for us are fabulous. Thank you. Thank you. The coins are beautiful. We have an event scheduled when we will present them to the members. I am sure that the badge will be just as beautiful. Thanks again. Thanks for the update. I presented the pins to the Client today and she was thrilled. Thanks again for everything. It was truly an enjoyable experience working with you and your company. . . even though we are miles apart — it didn�t matter. You are truly a Class Act to work with. Thanks again for everything! The pins were excellent. The design and quality of the pin were outstanding. They far exceeded our expectations. Our members are impressed with the quality and design, I have members that use to never wear a pin now wearing the new one. Thanks for you help, the service and quality of work from you and your company have made us long time clients and we will recommend you to any other FOP lodge wanting to design their own pin. Received the badge. Whew! I was beginning to sweat it. It looks really nice and I'm sure David will be very pleased with it. His commander will present it at his retirement ceremony on Thursday. Just wanted to say thank you. It was a pleasure doing business with such a professional. You did an outstanding job with this order from start to finish and I'm one satisfied customer. Thank you again and best wishes for continued success. We have received our lapel pins and they are just exactly what we wanted. Thank you for your fine work. As a law enforcement officer, I think your site is a beautiful tribute to public safety employees. You've outdone yourself! We like option 1. Thanks a million!!!!!!!! "Retired" Air Police Badges arrived today, 3 Dec via UPS from Collinson Enterprises. They are in mint condition — all the engraving is correct and they are just super in person. Kudos to you for your design and to Collinson Enterprises for producing an outstanding product. The hat badges that you did for us looked wonderful. Sheriff N and Major T were so pleased. Badges arrived today (Saturday) in mint condition. The artwork was excellent — but seeing/holding it in person is awesome, as I knew it would be. Collinson Ent. has produced a 1st Class Badge of superior quality, design is top notch. . . It speaks to a time that no one I know will ever forget. Great job as usual, Ron. Exactly what I had in mind. Got the retirement badge and all I can say is Thank You!! It�s awesome and I will treasure it always. Received the badges yesterday. They look GREAT!!! The engraving on the back is much sharper than expected. I know these guys will be really pleased when presented their badge. Thanks again for all that you do to make my job a little easier. The artwork is unbelievable! It is no wonder Dan will only deal with you. Great job! I can't stop looking at them. As expected, the pins are flawless (for their size of course). I have 20/10 vision in both eyes and I couldn't see distortions in the details. Your company never ceases to amaze me. Thank you. Shield arrived this morning. An absolutely beautiful piece of work. Got the two badges this morning and there are not enough descriptive words to describe the beauty of these badges. It gives me a real sense of pride to see my name engraved on the badge. Thanks again for your assistance on this matter. 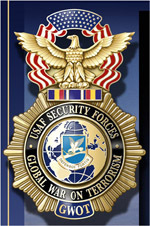 I am very proud of my military/air force service. I come from a long line of military veterans and service members. They are AWESOME! Excellent quality, I am very pleased with the order. Jim's badge just arrived via UPS, and it is absolutely beautiful. Jim won't be home from his police training near Harrisburg PA until tomorrow night and he will be thrilled! Thank you so VERY much! It is a treasure for sure! Absolutely, you have our business for as long as you're in business. I do appreciate your making these badges. In my personal opinion these are the most attractive badges I have ever purchased and I am so pleased to have them in my collection. I have received my Retired Security Police Shield and couldn't be more happy. I will proudly wear this shield on my Prince Charlie jacket (formal Scottish attire) while at Highland Games. In addition, I have it in it's display box on my desk. Thank you so much for taking the time to do things right. Just wanted to let you know I received the badge yesterday with no problems. It definitely exceeded my expectations and everyone I've shown it to at work was very pleased with the quality. Harris and I have reviewed the Badge Proposal and both think that it is GREAT!!!!!!!! We really LOVE IT. Thanks again for designing us the Best Badge in the District!!!! I just received them this morning. They are outstanding! I can't wait to present them to my guys. Thanks again for these great badges. Yes, this afternoon, I signed for the package from the messenger. These badges are absolutely more beautiful than I imagined! The detail is superior. Rich colors and super quality. Very nice way to remember and to commemorate the anniversary. I received your key ring for our Gold Star Families, survivors of Chicago police officers who have died in the line of duty over the decades. I'll be very proud to present each guest with this classy, high quality gift, courtesy of donations from Chicago police officers. Your company's workmanship is impeccable, your re-design service was perfect (and needed), and your prices were quite competitive. It is a pleasure doing business with you, all over the internet, and I anticipate more. I'm an Officer with the Metropolitan Police Department in Washington, D.C. and I just picked up my 911 badge and coin earlier today. A superb badge, to say the least. A job well done!!! I've also obtained a number of your other badges, both from your company and through fellow badge collectors. Your Metro Transit 25th Anniversary Badge is my personal favorite out of all the badges you've produced to date. The Metro Transit Millennium is right up there, as well. Without a doubt, your company does excellent work. 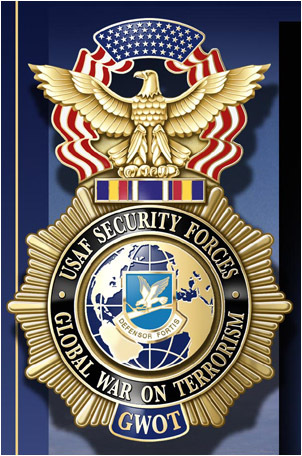 Wanted to let you know I received my badge today and what a great job you did. 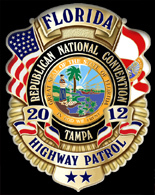 No comparison between your work and any of our past badges. The badges are just super. Senator Leahey stopped me today and complimented us on them. Great job. I love it even more. You do marvelous work. I couldn't be happier, thanks for coming through for us. I'm proud of your people. This looks great, Yes, Yes, Yes. I love it and I'm amazed. Thank you so much. Ron, the officers are very excited about the badge and I personally appreciate the extra mile you went for me. Thank you. By George, I think we finally "GOT IT" It turned out great! Everyone I have showed it to absolutely loves it. I just wanted to say Thanks for doing such a great job on the Pins. This week we had our largest Minds+Machines conference yet for GE Digital and the security team got a lot of compliments on the protection pins. . . and those #iprotectGE shield pins were a very hot commodity. Several people asked where we got them made. . . so I told them that your company logo was on the back. They became a huge conversation piece to start to get people to think more security minded, so thanks for getting them done last minute. I�m sure you will be hearing from me again soon! I just received a new Retired Border Patrol Agent badge from the Border Patrol Museum in El Paso, TX. I was happy to see it was made by Collinson Enterprises. It is exponentially better looking than the retirement badge the museum used to sell manufactured by another company. 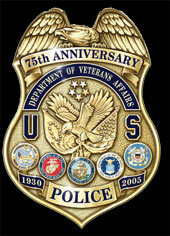 Anyone needing a custom badge, challenge coin, lapel pin, uniform insignia, etc., should contact Collinson Enterprises. They do it better than any other badge company out there. I received the beautiful lapel pins on Saturday night. They were absolutely beautiful. I presented them to our pastor yesterday, he was extremely happy to see they were completed so quickly!!! Your work is now being prominently displayed by our church members. Thanks so much for your speedy response, professionalism and excellent workmanship. It has always been a pleasure working with you and your company. Thank you so very much. We got the coins. They look fantastic and we are really pleased. Thank you so much. We really appreciate your help. I just wanted to take a moment to thank you for the coins. My Assistant Chief loves them as they came out great! Thanks again and I look forward to working with you in the future for any other coins we may need. Have a great day. Received the medals this week � they look incredible. Thank you for all of your work on this! The coins came in today and they are perfect!!! Thank you once again for working with me on the design, cost, and shipping. Your company will be the first one I refer to anyone looking to get similar products made. I just wanted to take a minute to thank you for the great work on the coins we ordered for Northwestern University�s School of Police and Command Class #438. The product was fantastic and everyone was thoroughly impressed. Several folks have asked for your information for assistance with designing items for their agencies after class ends later this month. Again, we appreciate all you have done to help us have a lasting piece of a memorabilia from our experience. THANK YOU Ron!!!!!!!!!!!!!!!!!!!!!!!!!!!!!! The new coins look fabulous and were such a big hit!!!! I can�t thank you enough for the quick turn-around!!!! You and your team are AMAZING!!!!!!!!! I just got the coins. They look great!!!!!!! I�m very proud of how they turned out. Outstanding job Mr. Ron!!! I received the coins last week and am very pleased. Thank you so much!!! Thank you SO much for such an amazing job on the USCP Senate Division Challenge Coins! Everyone LOVES them and can't wait to give them out to family and friends. People from other divisions are already asking for more. You guys did such a great job and they are a real big hit.Thank you both again very much!! The coins are absolutely beautiful and the definition so crisp and nice. Thank you so much for such a great job. I gave your name and info to two groups who happened to be at the function where I delivered several coins. Thanks so much. I am really pleased. We are extremely pleased with the results. They are exactly what we hoped and exceeded our expectations. I am excited to be able to use these moving forward. 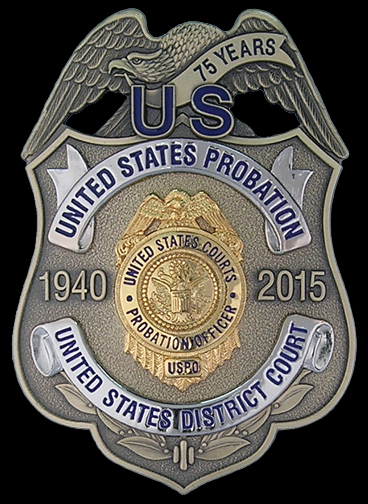 Our new practice will be to issue a commemorative coin at completion of probation, then five year anniversary points thereafter. Thank you for your time, effort, and craftmanship! I just want to thank you for making the North Reading Police Department Memorial coins. From my Chief to everyone in our ranks they love how the coin came out! It came out amazing. for all of your law enforcement badge and insignia needs.